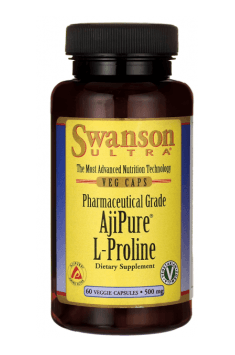 Swanson AjiPure L-Proline is a dietary supplement containing 500 mg of the amino acid L-proline per capsule. The preparation is characterised by nearly 100% purity thanks to the patented method of production AjiPure®, based on the processes of natural material fermentation. L-Proline is an endogenous amino acid, which means that the organism is able to synthesise it by itself. In terms of structure, it differs from other amino acid because of the presence of a secondary amino group in the molecule, which makes it in fact an imino acid. In physiological conditions, L-proline can be formed out of other amino acids – arginine, ornithine, and glutamic acid; however, because of the participation of proline in the formation of collagen, the basic protein of connective tissue, endogenous proline supply may prove insufficient for the optimal regeneration of the organism in the case of excessive strain on bones and joints. One fourth of each collagen molecule is formed by proline, where it is present in the form of 4-hydroxyproline. The hydroxylated amino acid is formed out of the source amino acid with the help of the activity of proline hydroxylase. In the active centre of the enzyme there is an iron ion, and its activity requires ascorbic acid, that is vitamin C. If there occurs vitamin C deficiency, hydroxylation does not take place, which results in the weakening of collagen fibres. Collagen is a family of fibrillary proteins, present in most tissues and organs, including bones, cartilages, tendons, and the skin. Its most important function is that of biomechanics – maintaining the structural integrity of connective tissue and giving it resistance to stretching. Collagen plays a crucial role in the process of wound healing, tissue regeneration, and the development of organs. Collagen is a great majority of the human bone mass, determining their durability and firmness. It exhibits the ability to stimulate bone-forming cells – osteoblasts. Moreover, it affects normal mineralisation of bones, giving them optimal resistance. Supplementation with L-proline can be, therefore, beneficial for people who suffer from osteoporosis. Collagen is a structural element of tendons. By increasing tendon elasticity, it protects them from ruptures, especially during intensive physical activity. Additionally, it supports post-workout and post-injury regeneration by accelerating the process. From the perspective of athletes and physically active people, it is an extremely important property. Those groups require more collagen than other groups. With age, the endogenous production of collagen decreases. It results in disorders in the structure of blood vessels, potential occurrence of joint cartilage dysfunctions, accelerated aging processes, reduced skin firmness and elasticity, and a deteriorated condition of nails. By increasing the synthesis of collagen in the organism, proper supplementation can prevent those ailments and minimise the negative consequences of deficiency. To sum up, Swanson AjiPure L-Proline is a preparation that supports the movement apparatus as well as improves the condition of the skin, hair and nails. It is recommended for physically active people in order to prevent ailments connected with bones and joints, rejuvenate the skin and make it firmer, improve the condition of nails, and accelerate regeneration processes and wound healing. AjiPure L-Proline 500mg 60 caps. As a dietary supplement, take one veggie capsule per day with water before a meal. The optimal process of collagen synthesis cannot take place without the right supply of vitamin C. That is why it is a good idea to combine L-proline supplementation with vitamin C.
Cellulose (vegetable capsule), magnesium stearate, silica.